Mohammed Deeb Salim Safi, a 28-year-old university graduate, lost sight in both eyes after being tortured in an Internal Security detention center in the Gaza Strip on grounds of allegedly participating in the “We Want to Live” popular movement which started last March. Palestinian Center for Human Rights (PCHR) calls upon the judicial authorities to investigate the incident, hold those responsible accountable, and provide immediate and necessary medical care to Safi. It should be mentioned that Safi suffered an Optic Nerve Disorder in his right eye due to psychological stress, noting that he does not bear considerable stresses. PCHR emphasizes that the detention of persons in inappropriate places and beating them constitute a serious violation of human rights, amounting to crime of torture. PCHR believes that Safi may have lost his sight due to torture and inhuman and degrading treatment. PCHR also stresses that detention of any person in the detention centers shall be after they undergo the necessary medical examination and that the detention center is fully responsible for the health condition of the detainees. PCHR hereby calls upon the Attorney General in the Gaza strip to investigate the incident, where Safi lost his sight following his detention and torture, to bring those responsible to justice, and compensate Safi for all the harm. PCHR also calls upon the official and healthcare authorities to act immediately to provide Safi the necessary medical care until he fully recovers. PCHR also emphasizes that arrest on grounds of exercising the freedom of opinion and expression and the right to peaceful assembly is a blatant violation of human rights. 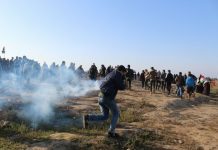 PCHR calls upon all the security services in Gaza to stop summoning citizens on grounds of exercising freedoms and end the policy of recurrent summonses and arbitrary detention.